PC Video to VGA Monitor over Gigabit Ethernet PC2VGANET – Atac Technology Co., Ltd. Extend your computer display & I/O across a Gigabit or standard Ethernet network to a far away VGA TV or any VGA display devices. Easy to swap computer operation, from the study to the living room, through the Gigabit Ethernet(more than 300feet). VGA output, compatible with LCD TV and monitor. Easily connect additional monitor with notebook/desktop computer via Gigabit Ethernet port . Compatible with all Notebook/Desktop computers. Two USB ports let you connect your most used peripheral(mouse/keyboard..). Audio output port for external speakers. Microphone input port and Earphone jack (green) output for easy Skype/MSN using. Mirror, Extend and Primary a computer display workspace. Support display rotation (Normal/Left/Right/Upside-Down) function control. Supports left, right, up and down extend display. Works seamlessly with Windows 7, Windows Vista and Windows XP operating systems. 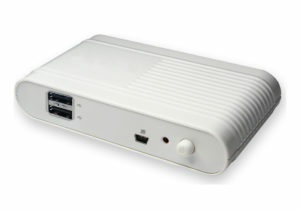 Ports include: 2 x USB 2.0, VGA, Speaker, Microphone, and Gigabit Ethernet. Provide one more mini USB for computer connection. External display output supported VGA. Supports resolution up to 1920 x 1080. IEEE802.3 : 10Base-T, 100Base-TX and 1000Base-T compatible, Ethernet RJ-45. When sending a video to the remote monitor, performance could decrease with below situations. If PC CPU is not fast enough because certain resource is needed when playing a video. If the video resolution is higher (the higher the resolution the lower the performance). If network bandwidth from local to remote is occupied by else applications. The more (up to 6) remote monitors to send to, the lower the performance. For example, video frame rate for sending to only one remote monitor is better than sending to 2 or more remote monitors. The PC to VGA over GigaNet extends host computer I/O across a standard Ethernet network to TV or any display devices, the PC to VGA over GigaNet allows to operate a far-away computer in any display device(especial the big size TV), it provide 1920×1080 high resolution and real time stream video display, with keyboard and mouse and full USB peripheral interoperability over a Giga network. the PC to VGA over GigaNet makes you enjoy the big size TV to be a computer primary or extend monitor, no matter play 1080P HD video on TV or Skype/MSN or any computer operation, it is best choice to swap your computer to a living room big size TV via Giga network.